In the coming days, a remarkably persistent weather pattern will begin to develop across North America and adjacent ocean regions. Characterized by strong high pressure near the West Coast and low pressure over the Eastern Seaboard, this “quasi-stationary,” high-amplitude atmospheric wave pattern will essentially become locked in place for at least the next 2 weeks. Patterns like this have a tendency to become self-reinforcing, lasting for much longer than more typical transient weather patterns and leading to prolonged stretches of unusual weather. 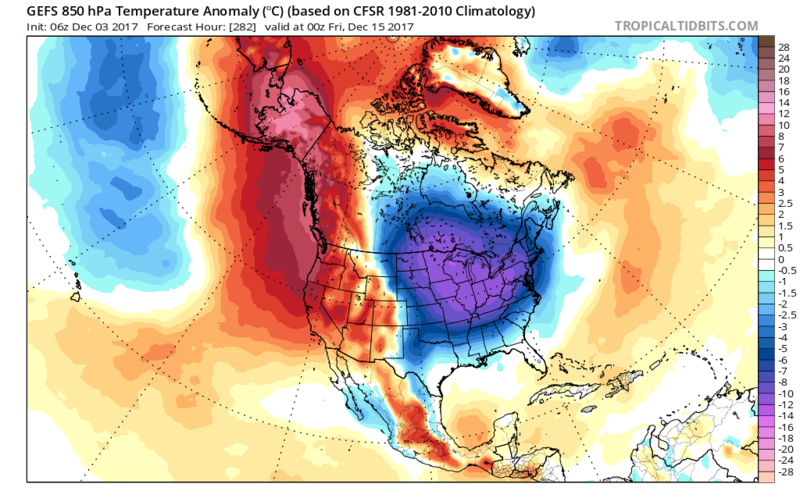 This particular event will be no exception: California (and much of the West Coast) will almost certainly experience an extended, multi-week warm and dry spell, while much of the East Coast shivers through repeated blasts of cold, Arctic air. As it turns out, these upcoming anomalous conditions provide a timely example of several atmospheric phenomena my colleagues and I have been studying over the past few years. In this post, I’ll explore the broader climate context of recent North American weather extremes, with a focus on insights gleaned from two recent scientific papers published by my colleagues and me. 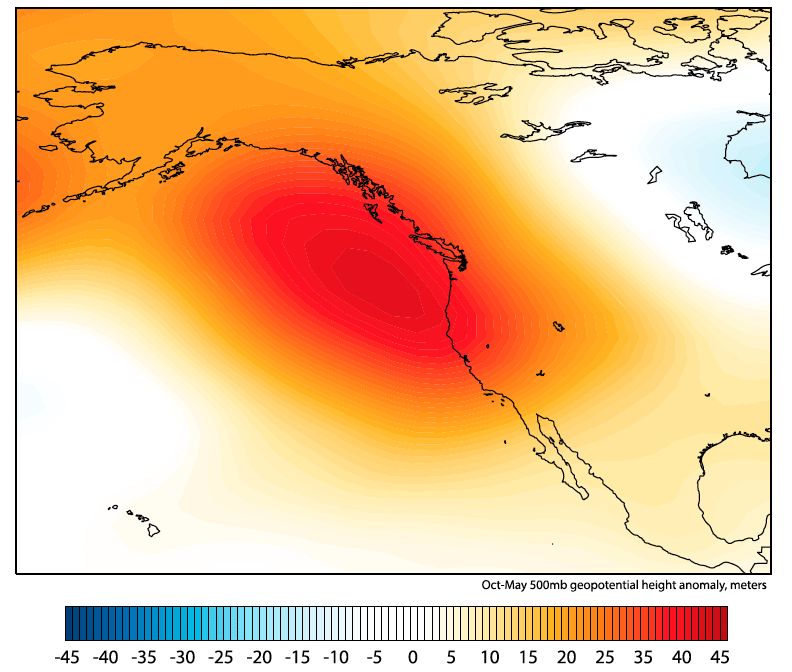 In 2013, a curious feature began to emerge on the weather maps: a region of unusually high atmospheric pressure (known as a “ridge” in meteorological circles) was consistently pushing the Pacific jet stream to the north of California, resulting in very dry conditions. At the time, I (somewhat jokingly) termed this anomalous high pressure zone the “Ridiculously Resilient Ridge” due to its implausible longevity, assuming that it would most likely recede by the subsequent blog post. Instead, the “Triple R” held strong straight through the entire winter—and then recurred, in slightly modified form, throughout the winters of 2014-2015 and 2015-2016. Global wind and pressure patterns are not uniformly distributed across the Earth’s surface. Even at a given latitude, prevailing climate conditions can vary greatly from place to place (compare, for example, the winter climates of mild San Francisco and often snowy Washington, D.C., which are both located near coastlines around 38°N). These spatial variations in climate are a direct consequence of the physical geography of our planet: the exact position of our continents, ocean basins, and major mountain ranges dictate prevailing atmospheric conditions on a global scale. In North America, these underlying geographical constraints yield a semi-permanent wintertime “wave” pattern in atmospheric pressure (in a two-dimensional map sense), which is characterized by generally higher pressure in the west and lower pressure in the east. This pre-existing wave pattern is not always easy to discern on surface weather maps, but becomes more apparent when considering pressure patterns at higher altitudes (often quantified as “geopotential height” (GPH)). This typical “western ridge/eastern trough” set-up predisposes the eastern U.S. to experience far colder winter temperatures than the West, as relatively mild southwest winds (originating over the Pacific Ocean) blow across the West Coast but harsher northwest winds (originating over the cold Canadian interior) blow across the East—producing a longitudinal temperature dipole. This “standing” (i.e. stationary) wave pattern is also the reason why California can be highly susceptible to long dry spells, even during the winter rainy season. More often than not, rain-bearing storms tend to veer northward just before reaching the West Coast due to the angled southwest-to-northeast trajectory of the jet stream as it approaches the west side of the semi-permanent Western ridge. Quite a few recent winters have featured not only extremely dry (and warm) conditions across much of California, but also numerous outbreaks of very cold, Arctic air across the eastern U.S. The Eastern Seaboard, in particular, has suffered through a number of regionally-crippling (and superlatively-named) “Snowmadeggon” and “Snowpocalypse” snowstorms. In most cases, these opposing extremes have occurred simultaneously due to an extreme amplification of this pre-existing “western ridge, eastern trough” configuration. Altogether, this recent flurry of wintertime extremes across North America raises the question: has there really been a sustained trend toward an increasingly pronounced winter temperature dipole? Our recent work (led by Deepti Singh) answers this question affirmatively: there has indeed been an increase in the number of days each winter characterized by simultaneously very warm temperatures across the American West and very cold temperatures across the East. We found that there has been a substantial increase in the propensity for extreme ridge/trough sequences to produce especially severe temperature contrasts across the U.S., and (to a lesser extent) an increase in the frequency of the relevant atmospheric “western ridge/eastern trough” pressure patterns themselves. Using climate model simulations, we further found that an increase in extreme temperature dipole days like those we’ve observed in recent years is considerably more likely in a climate with rising greenhouse gas concentrations than in a hypothetical climate without human influence. Intriguingly, this increase in contrasting dipole extremes appears to be caused primarily by the increased rate of warming in the western U.S. relative to the eastern U.S. While the eastern U.S. has indeed experienced a recent string of remarkable Arctic outbreaks, there hasn’t been a sustained trend toward cooler temperatures. 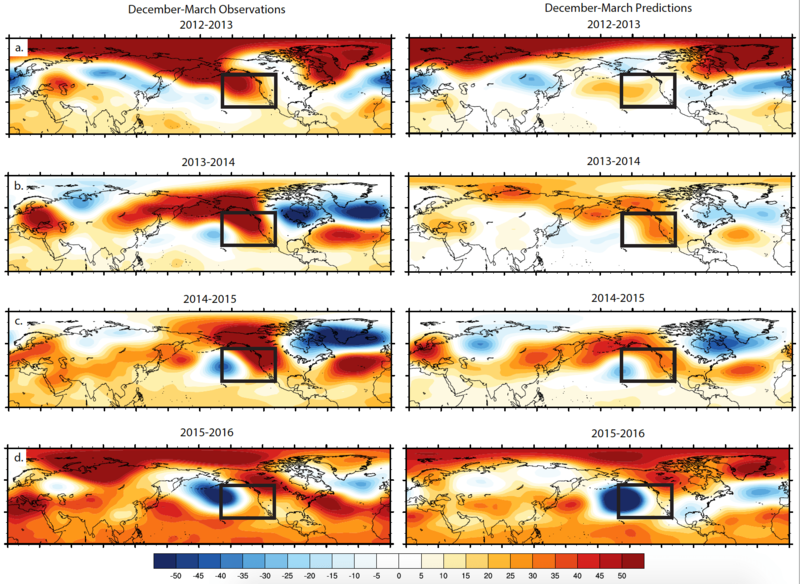 In fact, when we estimated future changes using climate model simulations assuming continued growth in atmospheric greenhouse gas concentrations, we found that the occurrence of these extreme temperature dipole days will soon start to decrease as winter warming accelerates across the entire United States—making it more difficult to achieve extreme thermal contrasts between the East and West. One question we weren’t able to assess in this study was how the atmospheric pressure patterns conducive to extreme dipole events might themselves change in the future. But in a separate paper, we have now taken a closer look at the “Western Ridge” half of the equation—and I’ll discuss those results below. In our latest paper, we set out to explore all of these hypotheses using a unified framework. Using a combination of real-world assimilated observations climate model simulations, we asked the following overarching question: are there traceable linkages between tropical/extratropical ocean temperatures, Arctic sea ice, and the occurrence of seasonally-persistent ridging along the West Coast? Ultimately, we found that there do indeed appear to be strong relationships between Pacific Ocean temperatures and persistent West Coast ridges conducive to dry conditions in California. Especially prominent are the links to western tropical Pacific Ocean warmth. These connections appear several months in advance, which not only suggests a causal linkage but also hints that it may be possible to predict the occurrence of “Triple R”-like ridges several months in advance. 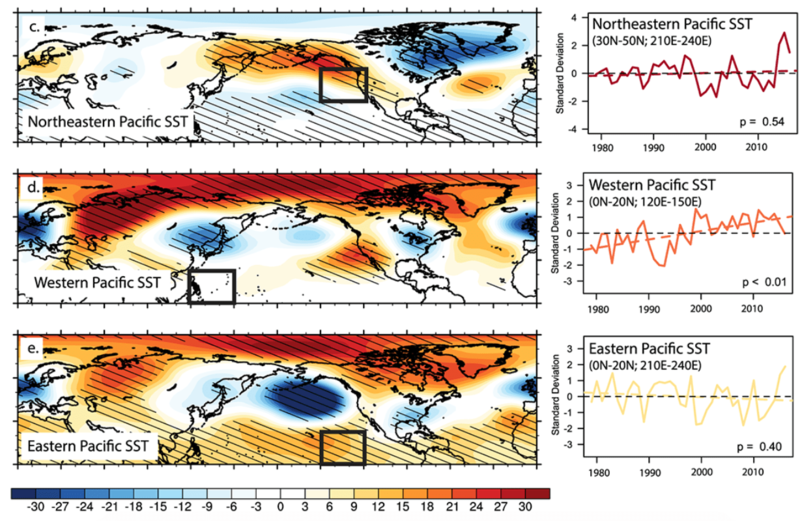 This result agrees with previous work by other scientists suggesting that displaced tropical precipitation associated with West Pacific warming can generate a trans-Pacific atmospheric “wave train,” favoring an enhanced subtropical ridge near California. We also reproduced the already well-known connection between cool “La Niña” conditions in the eastern tropical Pacific and broader high pressure in the Gulf of Alaska, which can also lead to dry conditions in California. 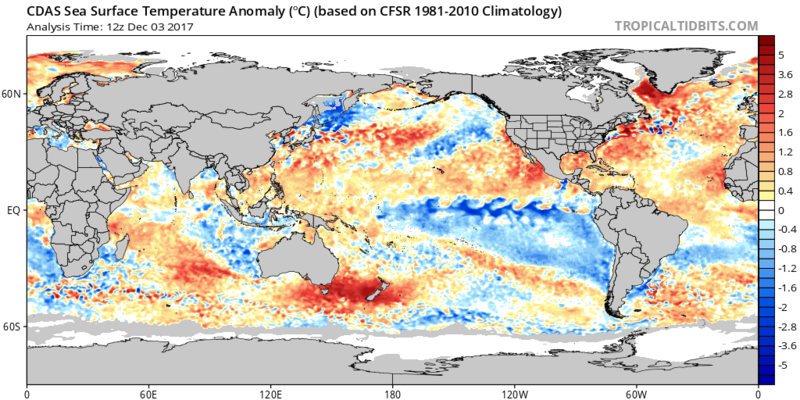 Importantly, the West Pacific relationship exists independently of the El Niño/La Niña (ENSO) cycle: that is, warm conditions in the western tropics can be sufficient to cause a California ridge entirely on their own. Of even greater interest: recent warming of this particular portion of the Pacific Ocean has coincided with a considerable uptick in the frequency of persistent winter ridging near California. This latter point offers further circumstantial evidence that at least some portion of the recent California drought may have origins in the warming tropics. What about “The Blob?” Well, we did find a strong statistical linkage between warm ocean conditions in the North Pacific and West Coast ridging—similar to that which occurred during the recent drought. 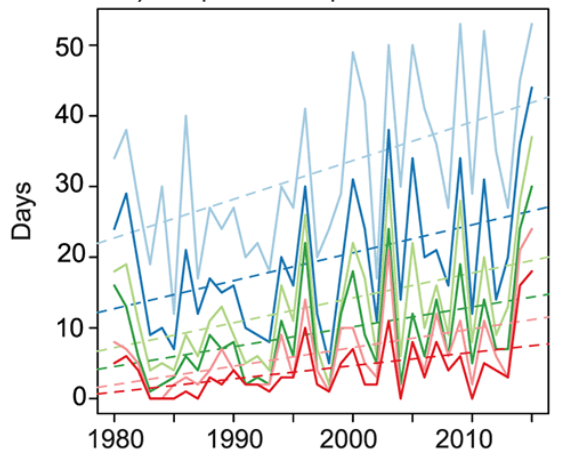 In this case, though, the “chicken or egg” issue rears its head once again: while a time-lagged relationship between autumn ocean temperature and winter ridging did exist in observations, only an contemporaneous relationship existed in climate model simulations. We posed two possible reasons for this divergence: either the persistent ridging itself caused the subsequent ocean warmth (rather than the reverse), or climate models may be underestimating the role that warm North Pacific SSTs can play in ridge-building. Additionally, it’s still plausible that warm ocean temperatures in this region, once in place, can enhance the persistence of ridging via self-reinforcement (i.e. high pressure causes the warm ocean in the first place, which then favors more high pressure, thus causing an even warmer ocean). And how about the sea ice hypothesis? Well, the link between Arctic sea ice anomalies and West Coast ridging remains…unclear. Our observational analysis hinted at a possible relationship, but climate model simulations disagreed. As my co-authors and I have previously emphasized, however, a scientific “absence of evidence” is not necessarily equivalent to an “evidence of absence.” That is to say: just because we didn’t find strong evidence of a connection doesn’t mean one doesn’t exist in the real world. The Arctic is now warming more than twice as fast as the rest of the world, and sea ice has been disappearing at a greater rate than had projected by climate models—a rapid rate of change that has complicated scientific investigations into high-latitude linkages. Indeed, the relationship between “Arctic amplification”/sea ice loss and mid-latitude climate remains the subject of a vigorous and ongoing debate in atmospheric and polar science circles. While it’s increasingly clear that these profound shifts in the Arctic have the potential to alter mid-latitude weather, it still is not clear precisely where, when, and to what degree. Thus, while our work does not obviously implicate sea ice loss in recent California extremes, it’s still plausible that stronger evidence could emerge using more sophisticated modeling tools or new observational approaches in the future. Ultimately, we confirm that unusual ocean temperatures are linked to seasonally-persistent West Coast winter ridging similar to the Triple R. Tropical warmth (in the West Pacific) and coolness (in the East Pacific) are both linked to different patterns of North Pacific winter ridging, and may offer an early warning of seasons with an elevated risk of dry conditions in California. Interestingly, tropical Pacific Ocean temperatures during autumn 2017 were warm in the west and cool in the east amidst a modest (and ongoing) La Niña event—a combination that suggests a substantially elevated likelihood of West Coast ridging this winter. To date, Southern California has experienced one of its driest starts to the Water Year on record, and strikingly persistent West Coast ridging is now expected to last at least two weeks. It will certainly be interesting to see how this winter plays out in the context of these new research findings. This blog post focuses on peer-reviewed research from two separate papers published in scientific journals (Singh et al. 2016 and Swain et al. 2017). While most Weather West articles are primarily based upon my own informal thoughts and analysis, this piece is directly informed by formal investigations by a team of scientists. I would like to thank my collaborators in this work—Deepti Singh, Daniel Horton, Justin Mankin, Tristan Ballard, Leif Thomas, Bala Rajaratnam, and Noah Diffenbaugh—for their invaluable support and ongoing insights. I am happy to provide a personal copy of any paper mentioned above (on which I am an author) upon email request. Want to learn more? Follow climate scientists on Twitter!